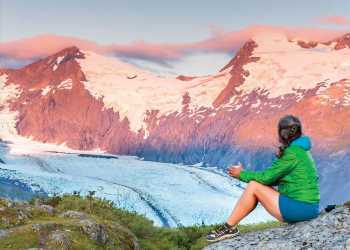 Protected by the Chugach Mountains and warmed by currents of the Pacific Ocean, Anchorage’s mild climate may come as a surprise. The city is farther south than Reykjavik and 400 miles from the Arctic Circle. Summertime regularly sees temperatures in the low 70s (20s C). In winter, high temps in the mid-20s (about -5 C) keep plenty of snow on the ground. While Alaska does have great variation in daylight hours. On the longest day of summer, the sun sets, dipping just below the horizon for a few hours of twilight. In winter, even the shortest day of winter sees seven hours of daylight, setting the stage for great northern lights viewing. No matter the season, there is always enough time for fun activities and adventures. Pack lightweight layers. The key is to add and subtract them as conditions change through the course of your activities. Stay toasty at the face of a glacier and cool in the heat of the late evening sun. Especially if you intend to spend time on the water - either on a day cruise, fishing or rafting - bring sunblock. Summer days are long in Anchorage. Speaking of sun block, most lodging in the Anchorage area have black out curtains, so the midnight sun won&apos;t affect your sleep. This region of Alaska is much drier than the Panhandle; August is one of the wetter months, but still sees less than 3 inches on average for the whole month. With the cooling temperatures come spectacular colors in autumn. Fall brings more frequent showers, with about 3 inches on average for the whole month of September. A waterproof coat is ideal. While the temperature does cool down in fall, a mid-weight coat should be sufficient. In addition to packing a warm sweater, you could also pack some lightweight thermal layers. Although this season is much cooler, still dress in layers. Temperatures are cool enough to keep snow on the ground. Factors like wind or sun exposure will impact how warm or cold you feel, regardless of the temperature. Layers like thermal leggings, thermal undershirts and wool socks make a huge impact on comfort. While winter days are shorter, even the shortest winter days still have more than 7 hours of functional daylight. 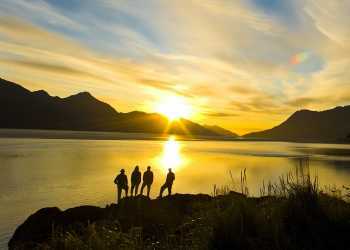 You can certainly feel the excited energy of locals as the days become longer and the temperatures rise. With the snow melting by April, waterproof footwear is a good idea to enjoy the trails. Just like most places, fall is a time for variable conditions; a mid-weight coat and a warm sweater should be versatile enough to meet unseasonable warmth and cool, shady spots alike. Packing for a visit to Anchorage can be summed up in one word: layers. The key to comfort in Alaska is layering clothing. If the breeze picks up on a day cruise, you might want a windproof, waterproof coat. Standing atop a glacier in the mountains, you may want a sweater or fleece. Then again, when you stop for lunch on a sun-soaked deck, you’ll want to be able to cool off in short sleeves or thinner materials. Just add or subtract layers as needed. Sunglasses are always a good idea – either because of the long daylight hours of summer or the bright, reflective snow during winter. Casual, comfortable dress is acceptable across Alaska. Don’t worry - if you forget something, Anchorage retailers have it.